Getzinger graduated from TCC with an Associate of Arts in 1989 before going on to Norfolk State University, where he earned a bachelor’s in English literature with an endorsement in early childhood education. Getzinger was especially fond of one history class, recalling that the professor invited students to her home for a supper study session prior to exams. A literature professor sparked his interest in English and gave him the confidence to attempt a project as arduous as a book. “Forbidden Romance” is historical fiction from the 1870s, set in Grayson County, Va., home to his mother’s family. 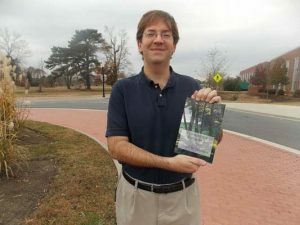 Getzinger, a genealogy buff, says the book is based on the true story of his great-great grandmother, Martha, named Mollie in the book, who had an affair with her brother-in-law. In the 330-page story, Mollie flees her life in the Appalachian Mountains for one in Kansas, telling no one why she left. “There are lots of twists and turns,” says Getzinger, who is currently writing a sequel. His biggest critic of his first novel was his mother, Lena, who helped with the editing process. Getzinger is proud of how accurate the book reflects the times – something many of the online reviewers note – as he spent many months verifying historical data. Since being published on July 31, “Forbidden Romance” has received seven 5-star reviews on Amazon.com. “That will, too,” he says.